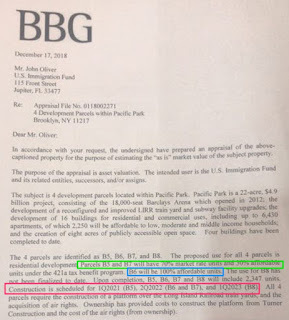 In my article yesterday for City Limits, Ever-Shifting Pacific Park Plan Highlights Uncertainty of Big Development Schemes, I pointed to a document produced for the U.S. Immigration Fund (USIF), a lender to the project, packaging a loan from immigrant investors seeking green cards under the federal government's EB-5 program. That document, part of an appraisal, suggested that three towers over the railyard would start in 2021 and 2022, with one of them, B6, containing 100% affordable units, thus getting the project closer to the 2,250 requirement by 2025. Developer Greenland Forest City Partners would neither confirm nor clarify the information in the document. 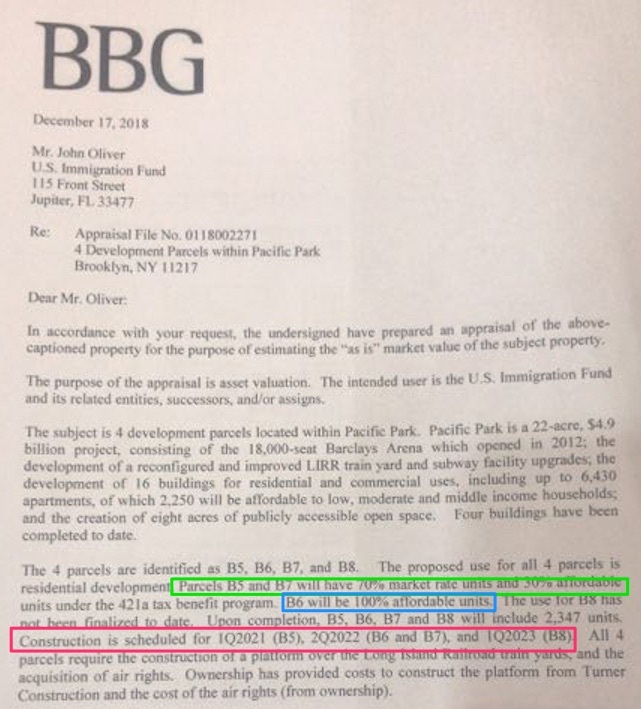 I suggested that the lack of candor might be because the company’s previous “100 percent affordable” buildings have faced criticism, or because the document indicates that at least two, and possibly three, of the project’s remaining towers won’t be built by 2025, once said to mark full completion of all 6,430 apartments. There might be another reason not to confirm it: as I wrote, projections to start by 2021 or 2022, given the development’s history, may be aspirational. We won't know for a few years. After all, it would be understandable to try to show the immigrant investors--who presumably are worried about collateral to repay them--that the project is chugging along. What about the General Project Plan? The developer instead offered a general statement: “Greenland Forest City Partners is fully committed to meeting our target of 2,250 units of affordable housing by 2025, and our development plan for the remaining affordable units will be in full compliance with the outlined General Project Plan." I didn't have space to address that, but they're actually not in compliance, as far as I can tell, with the 2009 Modified General Project Plan approved by Empire State Development, which oversees and shepherds the project. Then again, that's not fatal. Nor did the 2014 Modified General Project Plan Amendments say anything about affordability. But this isn't an attempt to play gotcha, since there's no penalty, as far as I know, for not complying with the letter of the General Project Plan. Rather, the key document is the Development Agreement, which does not require specific levels of affordability. Writing 6/7/17, I described a discussion at the Atlantic Yards Community Development Corporation, in which then-board member Barika Williams said she understood that the affordability levels of future units hadn't been set, but "we do have to hit a certain number of units at certain AMI [Area Median Income] levels." "I don’t remember that in the Development Agreement," commented Marion Phillips III, an executive with Empire State Development, softly and a bit quizzically. He was right--and that indicates huge wiggle room. The document--screenshot above right--simply defines affordable units as those "subject to income and rent restrictions" as part of a city or state regulatory agreement, with rents set at no more than 160% of AMI or, if higher, the highest percentage of AMI used in city or state housing programs. Unmentioned was that a certain fraction must typically be low-income units for tax-code purposes. But that leaves room for a disproportionate amount of middle-income units rather than moderate-income ones. "Each one of these units gets negotiated out with the agency that’s going to give us benefits," said Ashley Cotton, then an executive with Forest City New York. "Every single one is treated differently… depending on who the mayor is, who the agency is... They have their policy goals too." That's another example of the wiggle room I described yesterday.